Genetic diversity influences the fitness of species and provides variation for adaptation. Garcinia paucinervis Chun et How (Clusiaceae) is an endangered species with important ecological, medicinal and ornamental values endemic to Southwest China and Northern Vietnam, whose populations were severely fragmented in island habitats and population sizes were influenced by human. The assessment of genetic variation of G. paucinervis is anticipated to provide essential information for efficient conservation strategies. 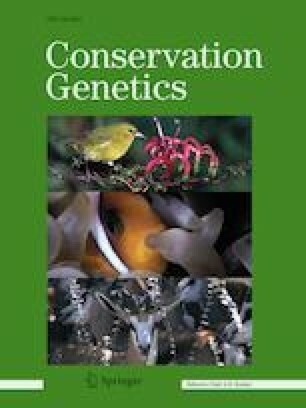 In this study, a suite of population genetics tests and analyses were used to investigate genetic diversity and structure of the 11 natural populations (a total of 360 individuals) of G. paucinervis in Guangxi and Yunnan Provinces, China, based on genotypes at 14 loci. Our results revealed a low to moderate genetic diversity in G. paucinervis remnants (HE = 0.487, I = 0.924, AR = 3.420). The global inbreeding coefficient (FIS = 0.004) showed significant deviation from Hardy–Weinberg equilibrium, implying that the risk of inbreeding depression accompanied by heterozygote deficiency was probably due to severe habitat fragmentation and decreasing population sizes. Significant bottlenecks were detected in two populations. There has been little recent exchange of genes between most of the population pairs. Mantel test revealed that the genetic distance was not related to the geographical distance, suggesting a limitation of gene flow. A population from Yunnan Province could be classified as an independent cluster separated from the other populations, which should be considered as a prior conservation unit. We would like to express our sincere thanks to Mr. Shi-hong Lü, Dr. Yan-cai Shi, Mr. Yun-sheng Jiang and Mr. Jian-min Tang for the field observation and collecting samples, as well as Dr. Ming Kang for comments on this manuscript. This project was supported by Natural Science Foundation of Guangxi (2015GXNSFDA13915), Guangxi Science and Technology Base and Special Fund for Talents (AD17129022), and National Natural Science Foundation of China (31600306).